I couldn’t decide whether or not I really wanted to blog about this incident since I tend to only like to capture happy experiences on this blog, but that wouldn’t be very authentic now would it? Life is full of surprises and changes, and they’re not always going to be good (at least not right off the bat). 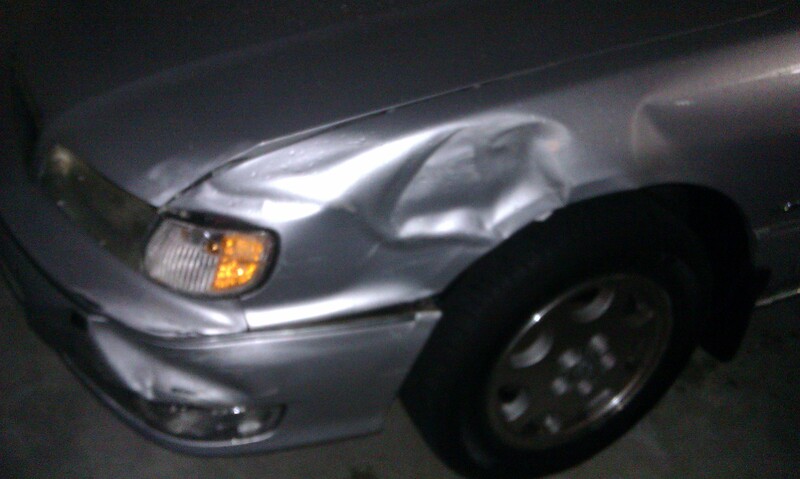 Almost two weeks ago, while I was on my way to work, I got into a car accident. Another driver headed the opposite direction as me tried to make an illegal U-turn and ended up swerving right into my lane, hitting my driver’s side. It was my first ever accident, and though I wasn’t physically injured except for a bout of whiplash that lasted a few days, needless to say it shook me up quite a bit. I’ve never had to go through the process of filing a police report, exchanging insurance information and dealing with replacing a totaled car. It goes without saying that I, as well as Drew, have had better days. I’ve probably cried more in the past two weeks than during any other point in our relationship. Between long winded phone calls with State Farm that always turned out less than lucrative to realizing my precious Infiniti was going to car heaven, it’s been a long process. Thankfully, Drew has been a trooper throughout the entire ordeal. From sitting in the waiting room with me for hours at Urgent Care to talking to our own insurance agent to try to expedite the settling process, Drew has really been my rock. Obviously I would have rather not gone through the entire ordeal but it reaffirmed that fact that Drew will always be there for me, and is a great partner. Gory details aside, my car was deemed totaled and Drew and I set out to do our research on finding a new (to me) used car. Yesterday we set our sites on a few locations in Marietta, and made the drive out to investigate a few cars that sounded promising online. Our first experience was laughable at best, mortifying at worst. Several of the cars we looked at had serious engine problems (the first wouldn’t even start; the second, a flashy green Mustang I wanted to test drive just for kicks, had frayed wires poking out every which way). Leaving that lot, I think we both felt pretty defeated. Our next stop was at the Jim Ellis dealership, and as we drove into the lot, I had a feeling we wouldn’t be able to afford a single car. We met with Charles, a sweet Haitian man that understood exactly what we were looking for and pointed us in the direction of the sole car that fit the bill. 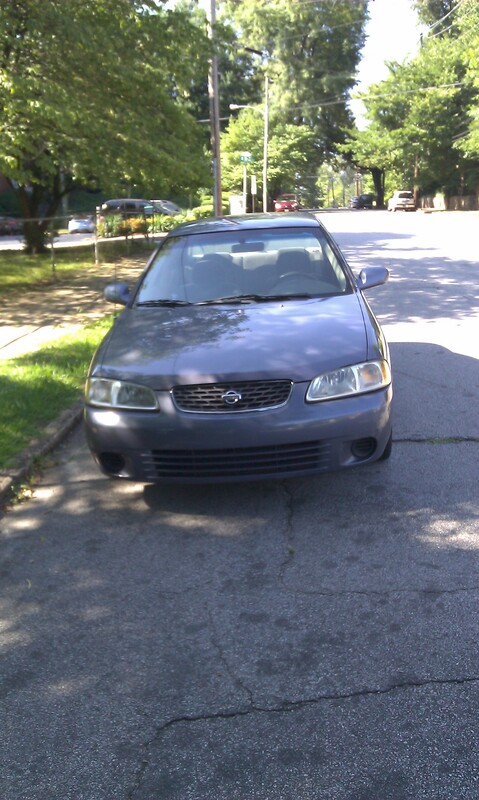 A 2000 Nissan Sentra with relatively low mileage and a doable sticker price had us practically jumping for joy. We took it for a test drive and I was more than relieved to see that no major parts were missing. Our celebratory new (used) car owners dinner. 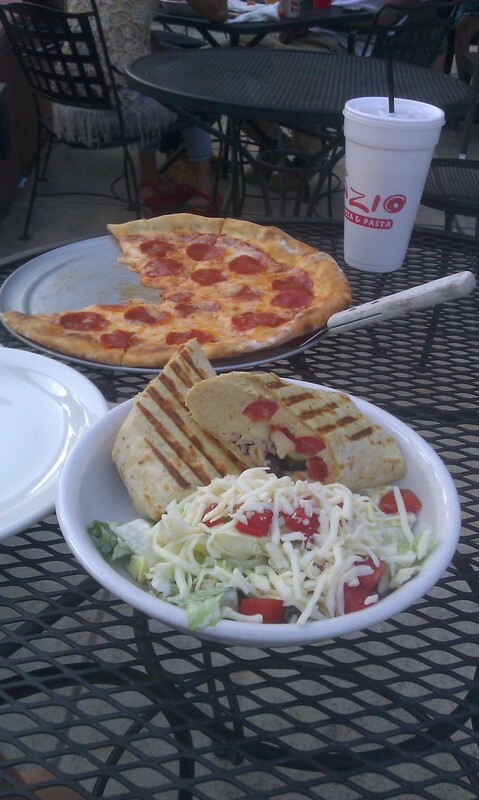 Pepperoni pizza for him, hummus wrap and salad for her. We are now officially the happy new owners of “Margaret” within a couple hours. Buying this car is probably one of the biggest decisions (at least from a financial standpoint) in the 10 months we’ve been married. Feeling proud and content with our purchase, we celebrated with a cheap, delicious meal from Little Azio courtesy of Scoutmob. It felt good to only spend $12 on dinner after swiping plastic for much, much more earlier in the day. Tomorrow I drop off the rental car I’ve had since the accident and after that, I’d like to think that this whole thing is behind us. I do have to attend traffic court next Tuesday to act as witness to the other driver’s illegal U-turn. That’ll be a first for me as well. Here’s hoping it’ll be a virtually painless experience and I’ll be on my merry way. In my new-ish car. Your mother is happy that this terrible ordeal has a happy ending, but she is also grieving for the Infiniti. It served our family well for all those years and I still remember when you, clad in bathrobe and house slippers, threw yourself across it on Christmas morning your sophomore year in college when you realized it was now yours. It continued to serve you well throughout college and almost your first year of married life. She probably had a few more years in her, but as you say, it has all turned out for the best. As for that man of yours, he is a wonderful husband. Obviously he is a blessing to you, but also to your parents who realize their daughter is in good hands. Love you both! So glad all worked out for you and the whole ordeal is now behind you. You have once again experienced the wonderfulness and awesomeness of being married to a Hawkins man. Have a good week. Love you! Megan, I am glad that it all seems to have worked out so well. Just like all challenges that all couples face, the important thing is that you all faced it together. Know that we were all out there cheering you on and we always do. Love you all.